Chemistry is all around us, and our quality of life is intimately linked to development of new materials and to a better understanding of all biological processes. A degree in Chemistry will give you unique insight into areas that are central to biology, geology, materials science, medicine, environmental science and many branches of engineering. Chemistry will be an integral part of solving global challenges such as human health, energy and the environment. Many graduates continue their education after completing their first degree, including medical school or graduate school. Not all Chemistry graduates wear white lab coats. As well as practical knowledge of the subject, Chemistry students develop many other skills prized by employers, such as problem solving, numeracy, communication, creativity and data analysis. A Chemistry degree can lead to career paths in professions such as medicine, pharmacology, agriculture, chemical engineering, journalism, law, forensic science and biochemistry. 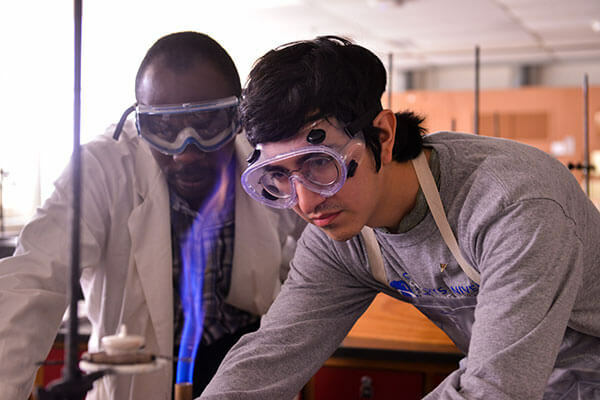 Chemistry students are highly encouraged to participate in student leadership opportunities such as the American Chemical Society of Students, undergraduate research, work-study, and community service opportunities. Many Chemistry majors seek summer research opportunities after their sophomore year, including with programs sponsored by the National Science Foundation and National Institutes of Health. Past students have participated in programs at universities, such as Princeton, Duke and Michigan, and medical centers throughout the United States.